The first part of this week started with several windy days playing havoc on boat control and creating challenging fishing conditions. 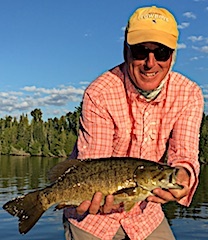 Our guests really persevered thru those two days and then the weather turned around giving them beautiful fishing conditions for the rest of the week and the Smallmouth Bass Fishing turned on. Long time Return Guest since 2001, Tony Kujawa from Lansing, IL came with good friend Mike Woolf, Tinley Park, IL for his 2nd consecutive year. Dealing with strong winds the 1st day they had fabulous fishing having tons of action and caught 39 nice size Northern Pike. 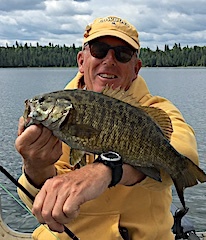 2nd day was off to Closs Lake Portage, with the winds still making boat control more difficult; they fished for Muskie having many follows but no takers. 3rd day had them trying a new technique for Smallmouth Bass and had a very good day catching more than 20 nice fish along with 8 Northern Pike. That evening after supper they did well catching 10 more nice Northern Pike on Spinner Baits. 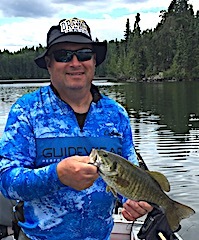 4th and final day was fabulous catching many Smallmouth Bass & Northern Pike plus Tony hooked and landed a huge 40-inch Muskie. 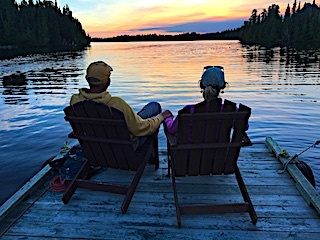 What a great way to end a fishing trip, both saying they had an unbelievable time and were sad to leave already thinking about the next time they return. David and Kathie Drake from Terra Haute, IN returned for their 13th visit with us at Fireside Lodge. 1st day was very windy with gusts to 40km per hour, but they did manage to catch about 10 fish. 2nd day started like the first but with showers so they took the morning off, returning to the water in the afternoon catching some fish. 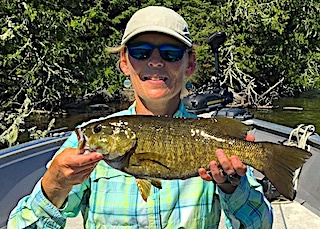 3rd day was excellent weather and excellent fishing catching a Bunch of BIG Smallmouth Bass with David landing two Trophy Master Anglers Award Smallmouth at 18, and 18.5-inches plus many more being just under that, and Kathie caught 5 Northern Pike. 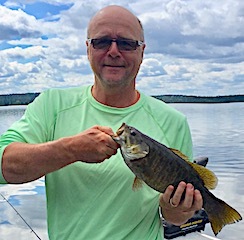 4th day was not as productive as the pervious day but they still caught fish, both Smallmouth Bass and Northern Pike and Kathie had a special catch landing a Northern Pike by lassoing it with the leader instead of hooking it with her lure. 5th and final day they had fun catching some Northern Pike and even doubled up each hooking a Pike at the same time and David, seeing that Kathie’s fish was larger, measured his and threw Kathie’s overboard before measuring hers. Both had a great stay and have hopes in returning again. Mike and LeAnn Sebade from Lander, WY returned for their 3rd consecutive year. DOA Mike caught some Pike, had follows, and got bit clean off from a big fish while using a very large Fly he uses fishing for Sailfish. 1st day was very good with Leann catching 11 fish and Mike following up with 9 fly-fishing. All year Mike has been haunted by a HUGE Muskie he had following his fly, opening its mouth, flaring its gills, just to slowly retreat and swim away. 2nd day was even better catching about 25 total fish in windy conditions. 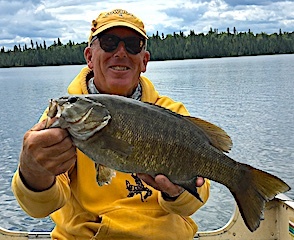 3rd day the weather turned around and they had a FABULOUS day catching a 32 to 35 large Smallmouth Bass along with several Trophy size up to 19.5 inches. 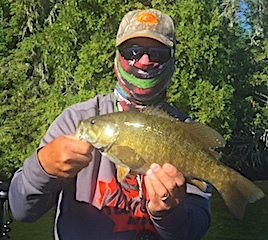 That same evening after supper they went to Mike’s special location and caught some HUGE Smallmouth Bass hitting a Whopper Plopper Surface Lure. You could just feel the excitement in their voices as they described the crushing Smallmouth Bass strikes. 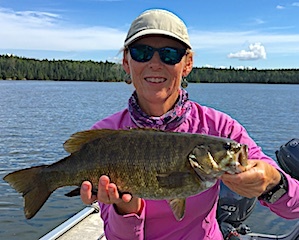 4th day they had tremendous fishing catching a good number of large Smallmouth Bass, Leann doing very well on soft plastics while Mike caught most of his fly-fishing until his arm wore out then switching back to Leann’s technique. 5th and final day they ended their trip on a high note catching almost 40 Smallmouth Bass, with most being big, using a variety of techniques including surface lures or flies, Ratl’n Rap, or a floating worm on a jig, which all had their high moments throughout the day, proving flexibility in fishing is important. Both left having a fantastic time not only fishing but also meeting a number of guests during their stay. The Klimes family Group returned for their 6th consecutive year headed by Brian & his boys Zach, Tyler, & Jordan from Willow Brook, IL, his brother Kenny from St Louis, MO area, brother Kerry & son Kody from Phoenix, AZ & Geno Dombrowski from Orland Park, IL. 1st and 2nd day was very windy which made boat control challenging, but all persevered having fun with family catching fish. 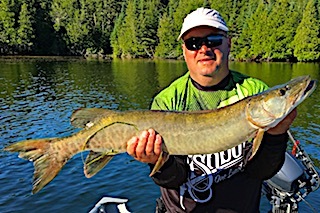 One fishing feat accomplished by Kenny was landing his first Muskie Fly-Fishing. 3rd day, after two days of strong wind, it finally calmed down and good thing because they were having their 1st Annual Eddie Clark Fishing Tournament. Rules were set as winner takes all and the winner being decided by the total length of one fish. 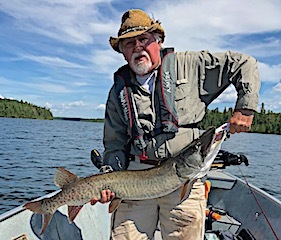 The measuring rules were, a Northern Pike was measured straight up, a Muskie was determined by its actual length plus adding two inches, and a Smallmouth was calculated by doubling its length. 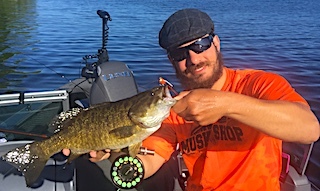 They all had a great morning catching lots of Smallmouth Bass, some Pike, and Kenny landed his 2nd Muskie fly-fishing it being his first ever Tiger Muskie. 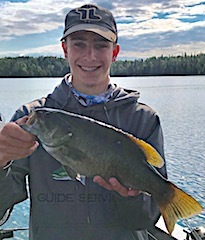 Kerry and Kody had a great day catching many Smallmouth Bass, Kody catching an 18-inch Trophy Smallmouth Bass, and a 17.5-incher fly-fishing, and Kerry won the tournament with his HUGE Trophy 18.75-inch football shaped Smallmouth. 4th and final day Kerry and Kody had a great day with Kerry catching a 19.25-inch Smallmouth Bass along with 14 other big bass, and Kody caught his Smallmouth fly fishing with a popper and a fly that was given to him by another guest. 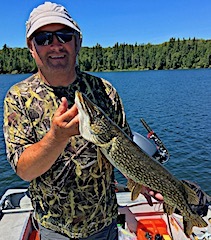 Kenny had a good day fly-fishing catching some bigger Northern Pike up to 37-inches and Brian his boys also did well catching Smallmouth Bass. All left having another wonderful Family Fishing trip full of laughs, and many memories made.